#3 Wayne Barlock from Eaton, CO leapt to the lead from 4th place to start the 25 lap Main Event, quickly fending off both #66 Kyle Clegg of Westminster, CO and #8 Jon Krizman of Loveland, CO. A spin brought on a double-file restart. After 3 laps of drag racing, Clegg retook the lead. His time out front was short lived as he got loose allowing Krizman to pass him on the inside. Krizman also passed Clegg taking 2nd just behind Barlock. Another spin out brought on another restart. This time, Barlock rocketed to the lead and Clegg beat out Krizman for the 2nd spot. Half way through the Main Event, Clegg and Barlock got into each other going through turn 4. Clegg hit the wall hard but he emerged from the wreck unscathed. His vehicle was totaled and his night came to an end. The race started up again with Barlock on the pole, Krizman had the outside of row one followed by #58 Kyle Ray of Littleton, CO and #13 Pete Dellarco. After a brief scuffle, Barlock took the lead. With only 9 laps to go, Barlock spun out coming through turn 4, dropping back 10 spots. Krizman sped into an easy lead, #13 Pete Dellarco and #58 Kyle Ray drag raced 15 car lengths behind. Dellarco suffered a malfunction on the last lap, allowing hard charger Wayne Barlock back into the top 3. Krizman won the race followed by Kyle Ray and Wayne Barlock. The weather was great and the Legend racing was also very good last night, as Jon Krizman won his third feature of the year at CNS. Jon has won the last two features at CNS and has the lead in the CNS points race. The feature finish had the top three in a repeat from two weeks ago. Phil Peconi started on the pole and led lap one. The cars of Clegg, Irwin and Krizman chased down Peconi and put on a good race for the number one spot. All three cars had early leads before Krizman and Clegg battled for the win in the last few laps of the race. A few spin outs by three cars kept the field of cars all on the same lap for the feature. 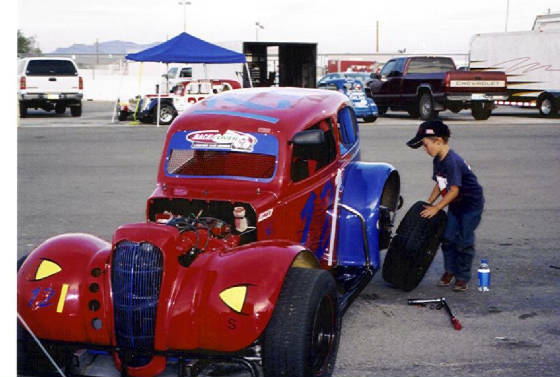 A. J. Canada developed electrical problems and had to pull to the infield during the race and the rest of the cars were running at the end. I think everybody felt like the race was very good and exciting. As I left the tower last night, several spectators said the race was exciting and to pass it along to the drivers. Heat Races were won by Krizman and Irwin. The first heat race Krizman at the line by a foot over Clegg. It was almost a repeat from two weeks ago. In the second heat race Wayne Barlock held the lead for many laps but was passed by the number twelve car of Justin Irwin of Albuquerque, New Mexico. 17.9 something, racers were walking around saying "man he is fast"
Darrell Stewart invaded the little track of Rocky Mountain Raceway. the fence watching these animals run around the track. "Running"
like "rocketing, flying or zooming" around the track. Plummer chasing me like I had taken his last beer. five fastest 3 were from Colorado. waited in anticipation as to which one would break the track record. bragging rights for the nights win. The qualifying lived up to everyones expectations as the locals pushed their "a"game to the front. Jon Krizman blasted 17.254 on the first lap of the two-lap format for qualifying breaking the old track record by almost a 10th, everyone including the announcer cheered and clapped. If this had been golf, Jon would have had to ask for a loan to pay for all of the drinks he would have had to buy. suffer an unavoidable wreck that would end his night early. this was going to be a race for 5th place for the locals. group blew by the leaders on the start like they were standing still. dealer Brandon Burton, Jon Krizman, Terry Plummer and up and coming rookie Ryan Bird and new track champion Mike holder separated themselves from the rest of the pack and started to lap cars by the 10th lap, only a yellow flag on lap 19 would bring the pack back together. the early days of the Nextel champion. "Retirement policy for me”. Billy “I brought a mule to a horse race" C.
The Legends Car Series season finale turned into a wild contest, with Jon Krizman taking his first victory here, and Terry Plummer earning the 2004 title. The top two in the standings going into the event – Jay Sant and Danny Medina – battled at the front of the pack during the early stages. In a near-replay of last week, the pair tangled, dropping both from championship contention. The incident placed Barry Dykes in the lead, but his time heading the field was short-lived, as he lost control and spun while being challenged by Krizman. Plummer, up to second from ninth on the starting grid, followed Krizman to the checkered flag, two lengths behind. Anthony Medina, Chip Newman, and Greg Yongue completed the top five. John Mark Chiesa was named the Legends Car Series Rookie of the Year.